Do you have free time before a flight? Let Music City Mobile Closet Help! Bag fees: $15.00 for the first bag and $10.00 for each addition bag. MCMC will pick up and deliver your bags to any location within delivery area. Pricing applies to a service area of a 5 mile radius of downtown Nashville. A trip fee will be applied to locations outside of the service area. The mission of Nashville Zoo is to inspire a culture of understanding and discovery of our natural world through conservation, innovation and leadership. Nashville Zoo is a progressive and dynamic zoological park serving Middle Tennessee, southern Kentucky and hundreds of thousands of tourists that travel to Nashville every year. Since opening its doors in 1991, the Zoo has grown from a small, private operation in Cheatham County to an Association of Zoos and Aquariums (AZA) accredited facility with international conservation involvement. Over 960,000 visitors come to Nashville Zoo annually, making us one of the top attractions in Middle Tennessee. Come to Belle Meade Plantation to experience everything that is beautiful about the South. Guests are warmly invited to delve into the rich history of this lovely home and estate by taking part in a diverse list of both enjoyable and educational activities. This site is dedicated to the preservation of Tennessee’s Victorian architecture, history, and equestrian legacy. Visitors can enjoy tours, educational outreach programs, shopping, dining, wine tastings, weddings and other happenings knowing that their patronage supports the educational mission of Belle Meade Plantation. The rich story of Belle Meade comes alive as our period-dressed guides lead guests through the mansion and tell the exceptional and intimate stories of the various people that created Belle Meade Plantation. Throughout the 45-minute guided tour of the Greek-Revival Mansion, a century of the plantation’s history is told through the stories of the Harding-Jackson Family. Another perspective is offered in our Journey to Jubilee tour, an experience in which you will uncover the stories of those skilled laborers who contributed so much to the preeminence and renown of this estate. Additionally, explore and enjoy the rich history and nature of Belle Meade on a Guided Segway tour of our property. From the complimentary wine tastings to the newly refurbished ice cream and fudge shop, Belle Meade provides many activities for the entire family. 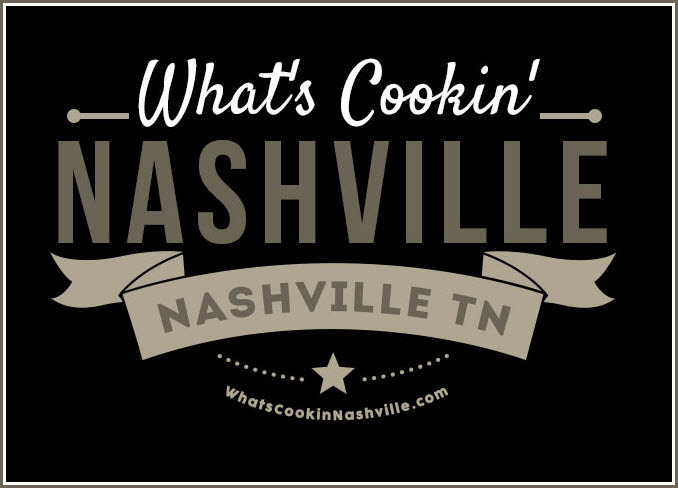 LADY ANTEBELLUM, CHRIS JANSON, LUCIE SILVAS, SHANNON SANDERS, ANDREW COMBS, KID POLITICS, JASON ESKRIDGE, KATIE SCHECTER, AND THE NASHVILLE SYMPHONY WILL PLAY THE FREE MUSIC CITY JULY 4TH PARTY! You know you’re coming. Go ahead and book your Vacation Package which saves you money, so you can do more for less in Nashville. The main stage will be located at Fifth Avenue and Broadway. After the concerts, the show will shift to Cumberland Riverfront with a fireworks show synchronized to a live performance by the Nashville Symphony who will play from Ascend Amphitheater. The FREE Nashville July 4th app is all the information you need for the Let Freedom Sing! Music City July 4th celebration in the palm of your hand. Download it. With any other questions, take a look at our FAQs page at visitmusiccity.com/july4th-faq or ask us on social media. We’ll be sharing all the fun by posting on Twitter, Instagram, Facebook, and Snapchat. Start following now for event updates, news, music, and more. Real Estate Companies in the Nashville Tennessee area. Fate Sanders Marina is located on beautiful Percy Priest Lake between Nashville and Murfreesboro. Our state of the art rental slips can accommodate any size boat or Yacht. Our Restaurant serves a variety of dishes from breakfast to dinner. We have a tackle shop that fit every fisherman needs. We are open 360 days a year at 6 am. Come out, enjoy dining on the water with us and don’t miss the beautiful sunsets. State of the art boat slips for all types of boating enthusiasts from open slips to 60 ft covered slips we can handle your boating needs. Fate Sanders Marina offers pontoon boats and fishing boats for your boating pleasure. All of our boats are equipped with electric start four stroke engines. We have 25 and 30 foot pontoon boats pontoon boats with upper deck and a slide. Click on maps maps for more info. Cabins Available Year round Bass, Crappie and Striper trips. Percy Priest is 16th on the nation for most popular Crappie lakes. Cabins Available Largemouth and phenomenal Smallmouth fishing December through March. Fall – spring Largemouth and Smallmouth Bass fishing. Fantastic Smallmouth in late fall, winter and spring. Fall giant Crappie trips. Cherry Blossom Walk 9:00 a.m. – 10:00 a.m.
Nashville Cherry Blossom Festival 10:00 a.m. – 5:00 p.m.
family-friendly celebration of spring and Japanese culture. The Nashville Cherry Blossom Festival will kick off at 9 a.m. with the Cherry Blossom Walk.Nashville Mayor Megan Barry and the Consul General of Japan in Nashville, Masami Kinefuchi, will lead the Cherry Blossom Walk. The 2.5 mile course begins and ends at Nashville’s Public Square, the site of the Nashville Cherry Blossom Festival, and follows the Cumberland River Greenway, looping at Sister Cities’ Magdeburg Connector to Morgan Park in Germantown. The Sakura Walk is free and open to the public. No registration is required. The walk is sponsored by Sister Cities of Nashville and the Japan-America Society of Tennessee. Join us for the Walk! Thanks to the generous support of our corporate and individual sponsors, 800 cherry blossom trees have been planted throughout Nashville. We are getting closer to our decade-long quest to plant 1,000 Japanese cherry trees. We can already imagine the 800 cherry trees planted in the last eight years full of beautiful, pink blossoms this spring, and we hope you will join us as we watch both the trees and the festival flourish in the years to come! 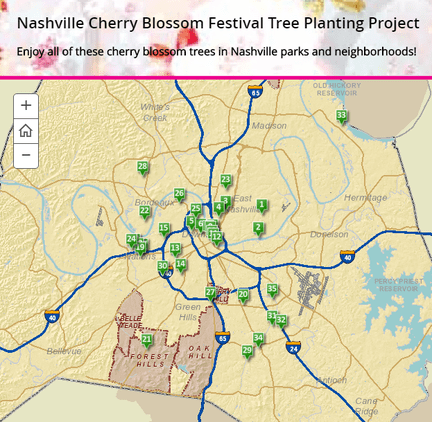 Click on this map for our interactive Tree Planting Project map with photos and descriptions of all cherry blossom tree planting locations in Nashville park and neighborhoods.Special thanks to Jennifer Higgs, Director of GIS and Mapping Services with Metro Nashville Planning Department, for designing our interactive map! The Nashville Cherry Blossom Festival will be on April 8, 2017. Please click below to register online.